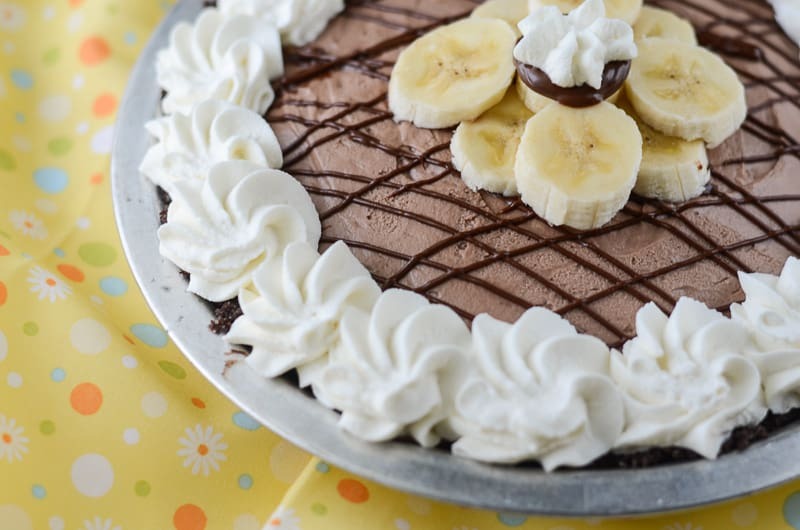 Fresh bananas, chocolate graham cracker crust, and a hazelnut filling make this Nutella Banana Cream Pie one to dream about! I am one of the many people in the world obsessed over Nutella. I admit it. I love dipping my apples in it; that’s probably my favorite easy snack. But when I get one of the (many) chocolate cravings I suffer (ha) from (haha), and have no apples in the house, I like to sneak to the pantry, grab the Nutella and a spoon, and go to town on the jar. Remember, not too long ago, when Ferrero used to say Nutella was healthy for you? All those wholesome commercials with kids and their Nutella toast for breakfast, and then the world wisened up. Just when we thought something so damn delicious was actually not terrible for you. We should have known better. But you know what is healthy for you? Bananas! 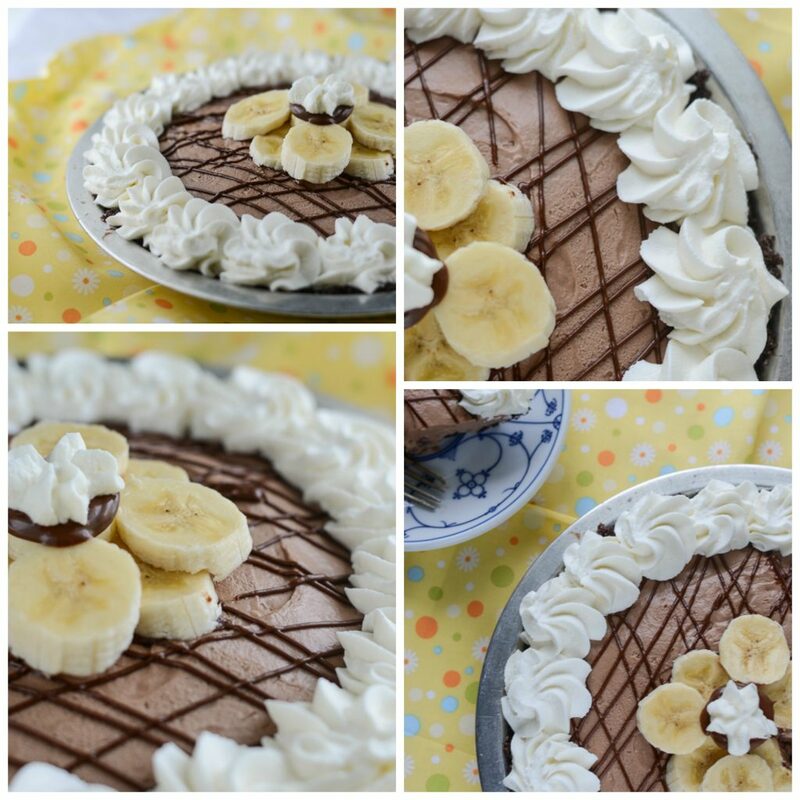 Unfortunately, I took the healthy part away when I put them in this indulgent Banana Cream Pie. This pie was born last Saturday, at my best friend’s house. Mr. Crumby and I made plans to spend the afternoon with her and her SO enjoying the terribly hot Florida weather by the pool with some wine and dessert. That morning, I was terribly motivated to bake something (because pretty much any time I cook or bake, it’s possible blog fodder! ), but by the time we’d eaten breakfast and washed up, I was sitting on the couch like a slug, too lazy to do anything but snuggle the Hubs, pet the pooch and enjoy some bad TV. But, I’d made a promise to bring something sweet to pair with our lunch of Apothic, Sangue di Giuda, and Moscato, and I just couldn’t let my bestie down. In my semi-lethargic daze, between commercials, I browsed through my Pinterest boards blindly, looking for inspiration. Cupcakes? Nah, too typical for me. It was too late to make and ice a cake for it to be ready in time. Didn’t feel like cookies. Oooh. Lightbulb. I had just bought a jumbo-sized jar of Nutella. Pushing all lazy thoughts of just taking the jar and four spoons to her house, I edited my search. Lo and behold, I found Nutella dip! Dozens of different recipes, all working toward the same happy goal. After a lot of deliberation, and annoyance that I didn’t have any CoolWhip in the fridge (LazyMonster no wanna whip cream! ), I decided on one similar to a pumpkin dip I’d made before, from Cooking Classy. A cream cheese-based one, with lots of Nutella, and whipped cream to boot. 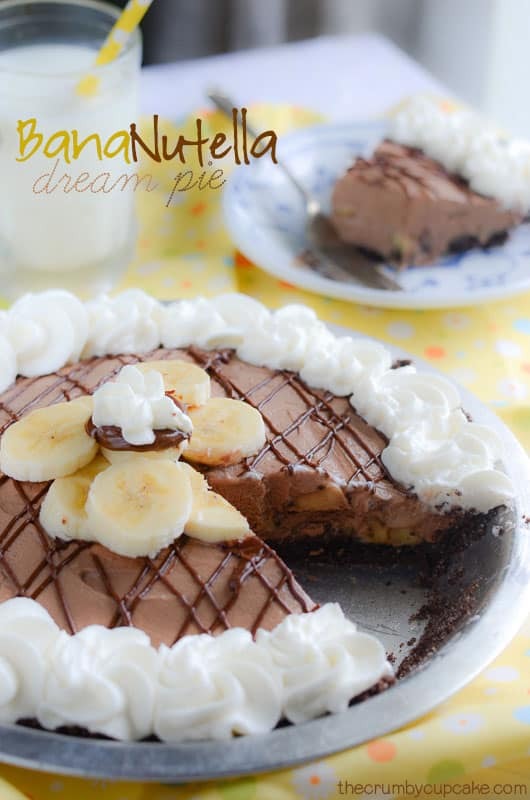 And thus birthed this Nutella Banana Cream Pie recipe. This pie is to die for. I can’t wait to make it again, so I can see what else I can put in it to make it even better. Strawberries? Coconut? Mini chocolate chips? Preheat oven to 375 degrees F. Mix graham cracker crumbs, sugar, melted butter, and cinnamon, and salt until well blended. Press mixture into two 8- or 9-inch pie plates. Bake crust for 8-10 minutes. Cool on wire rack for 60 minutes, or in refrigerator for 30. In a large bowl, whip heavy cream, 3 tablespoons powdered sugar, & vanilla with a hand mixer until soft peaks form. Set aside. In a large bowl, beat cream cheese and 1 tablespoon powdered sugar until smooth and fluffy. Add Nutella, mixing until incorporated. Fold ⅔ of the whipped cream into cheese mixture gently with a spatula, until incorporated. 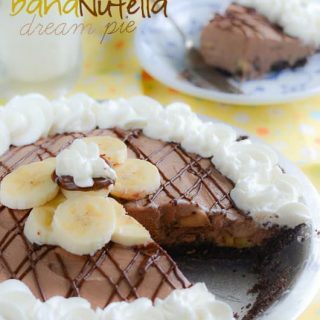 Place a layer of sliced bananas on the bottom of the pie crust, followed by a layer of Nutella cream. Repeat. 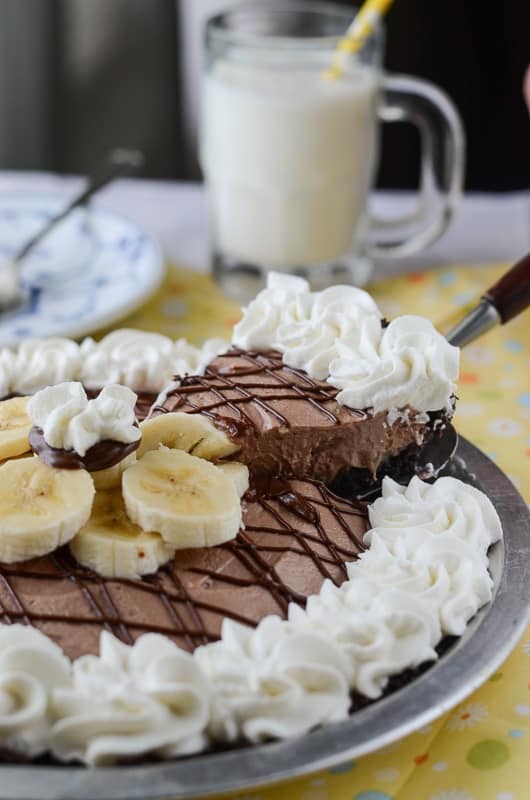 Spread or pipe the remaining ⅓ of the whipped cream on the top of the pie, and garnish with Nutella drizzle and banana slices. Repeat with second crust. Refrigerate at least 2 hours to stiffen to make cutting and serving easier. Don’t worry. I won’t judge you if you lick the screen. I don’t know what I’m drooling over more: the banana or the nutella. 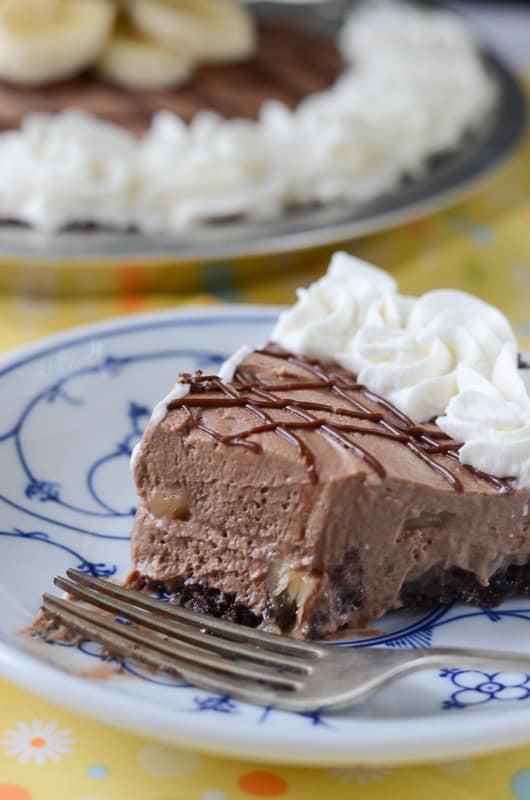 Either way – best pie ever! I LOVE Nutella! I make my own and it never lasts long enough to make a tart..I’ll have to make a double batch next time so I can make this! Oh my gosh, I bet this would be even more amazing with homemade Nutella! You’ll have to let me know how it turns out!! Oh man…this looks heavenly! 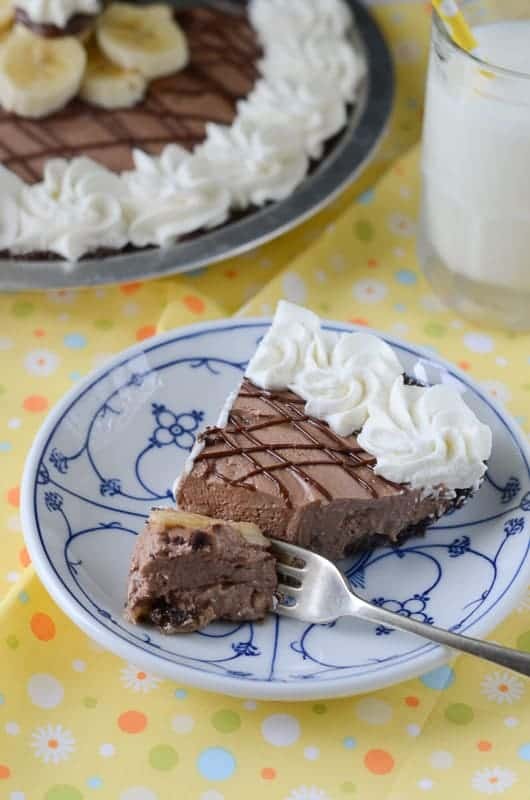 I am so into no-bake pies as of late since it’s just too hot to turn my oven on. Banana and nutella is a dream! Thanks so much, Katy! It has seriously been ridiculously hot. That may have been a contributing reason to why I didn’t want to bake Saturday!